In the University of Malaya Medical Centre (UMMC), research involving animals have to be reviewed by the Animal Care Committee, whereas research involving humans require clearance by the Medical Research Ethics Committee (MREC). The objectives of the MREC are to safeguard the rights, safety and well-being of human research volunteers, provide timely, comprehensive and independent review of the ethics of proposed studies and ensure that there is due regard to existing laws, regulations and community attitudes. An Ethics Committee (or Institutional Review Board) is an independent body of medical/scientific professionals and non-medical/non-scientific members that reviews, approves and provides continuing review of human research/trial protocols and amendments, and of the methods and materials to be used in obtaining and documenting consent of the human research subjects. Chair (A clinical academic staff appointed on advice of the Dean, Faculty of Medicine, UM). Deputy Chair (A clinical academic staff appointed on advice of the Dean, Faculty of Medicine, UM). Director of UMMC or named representative. A clinical academic staff from the Department of Medicine, FOM-UM, nominated by the Head of Department. A clinical academic staff from the Department of Surgery, FOM-UM, nominated by the Head of Department. A clinical academic staff from the Department of Psychological Medicine, FOM-UM, nominated by the Head of Department. A clinical academic staff from the Department of Paediatrics, FOM-UM, nominated by the Head of Department. An academic staff from the Department of Pharmacology, FOM-UM or from the Department of Pharmacy, FOM-UM may be nominated, as a permanent representative by the respective Heads of either department. Head, Department of Pharmacy, UMMC or named representative. Dean, Faculty of Law, UM or named representative. Lay member (at least two, of whom at least one shall not be qualified in the life sciences) nominated by the Chair, UMMC-MREC. Statistician (at least one) nominated by the Chair, UMMC-MREC. Secretary (at least one) - an officer of UMMC, by appointment of the Director, UMMC. Only MREC members who are independent of the investigation and the sponsor of the study may vote or provide an opinion on a study related matter. The Secretary has no voting rights. The MREC may invite non-members with expertise in special areas for assistance. MREC can only convene or make a decision if at least 5 voting members are physically present and approval will only be granted if the majority of voting members approve the study. The MREC answers to the Board of Directors, UMMC but is independent in its decision-making. The decisions of the MREC are also informed to the Medical Advisory Committee (body of clinical consultants) of UMMC. When a study is completed. research that may impose an undue disadvantage upon participants. For studies that are conducted outside UMMC/FOM, researchers can also apply for UMMC MREC ethics approval, if the researchers are from UMMC/FOM staff. UMMC MREC will consider application for studies that are conducted outside UMMC/FOM if the researchers are from UMMC/FOM. However, the researchers should also seek ethics approval from the respective institution (eg. National Medical Research Registry for public hospital and clinic) before conducting the studies. In the consideration of a study, particularly clinical trials, the MREC requires that it be conducted in accordance with ICH Harmonised Tripartite Guidelines for Good Clinical Practice (ICH-GCP). In principle, there should be respect for the dignity of the person (the right to information, informed consent and the right to refuse or withdraw from the study) and the research should not over-ride the health, well-being and care of the subject. In this regard, the information given to subjects in the obtaining of informed consent should be in simple layman language. The MREC may request for translations if they think the study population would require that particular language. cost considerations including coverage of inconvenience, adverse reactions and injuries to subjects, and special sensitivities of the community. The review process may (and often does) involve an interview of the Principal Investigator. The MREC meets regularly once a month, except in December. Meetings are usually on the third Wednesday of each month, to review proposals received by the first week of that month. For MREC's first decision to the new study, review timeline is within 1 month from receipt of application by the Secretariat. For modification to the new study, the cut-off date is within 2 months from request for modification. Otherwise, the study will be archived and new application required. For amendment, notification or other revision to approved study, the review timeline is within 1 month from the date of receipt by the Secretariat. Please read through all of the information in the sections above before applying. Consider applying to the UMMC MREC only if one of the investigators in your study is from University of Malaya Medical Centre (UMMC) or Faculty of Medicine (FOM), University of Malaya. Investigators who are NOT from UMMC/FOM must appoint one investigator from UMMC/FOM to apply for the research ethics approval. The applying investigator as well as all investigators are accountable for the research conducted in UMMC. 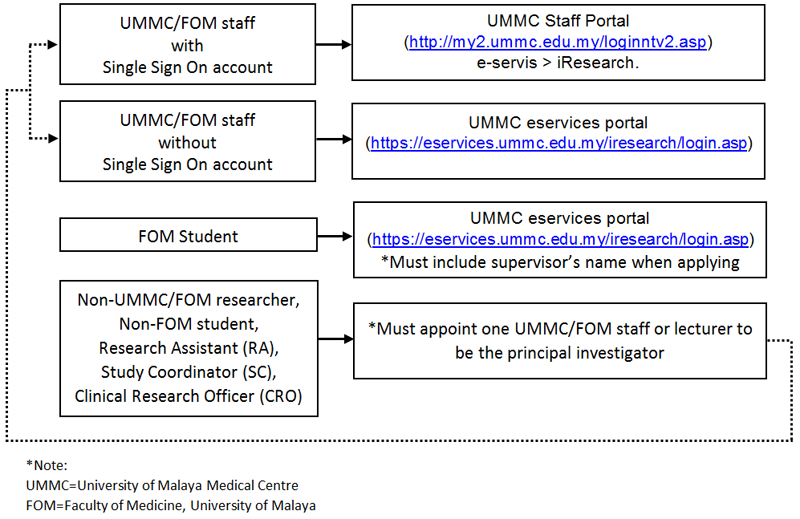 For a UMMC/FOM investigator who has a Single Sign On (SSO) account, please apply via the UMMC Staff Portal (http://my2.ummc.edu.my/loginntv2.asp) at e-servis > iResearch. For a UMMC/FOM investigator who does NOT have a Single Sign On (SSO) account, please apply at the UMMC eservices portal (https://eservices.ummc.edu.my/iresearch/login.asp). Students from FOM can apply for the UMMC Research Ethics Approval but he/she must include his/her supervisor's name (who are from UMMC/FOM) when applying. Students who are not from FOM should appoint one lecturer from UMMC/FOM to apply for the Ethics Approval. Research Assistant (RA), Study Coordinator (SC), Clinical Research Officer (CRO) or any personnel from the pharmaceutical company are not allowed to apply for UMMC research ethics approval instead the UMMC/FOM investigator who is in the same team should apply for the ethics approval. Click here to download the template of the MREC Online Application Form . *Note: The MREC only accepts online submission. This template is just for reference and discussion with co-investigators before submission. Click here to view the flow chart of the process of the Research Ethics Application.